The Nation’s Capital, the heart of the American Dream, a World Contender. Many from other countries flock here to complete part of their bucket list. However, for many Americans we don’t even have it pass our minds. Check out some hot spots in the DC area that may want you to come and be a tourist in your own nation. It’s in every block buster movie so why not take a tour and learn something? Make sure you have good shoes as you have access to many famous areas you will recognize. This is the official workplace and residence of the President and has been since John Adams in 1800. The famous monument that is recognized for democracy in the world is always open for tours. The hours of operation are from 8:30 am to 4:30 pm. Monday through Saturday except for national holidays. You can get passes to witness Congress in play from your Representative or Senators. This is another famous place, full of America´s history of many gatherings of social movement. This national park is a perfect place to enjoy the nice weather as you reminisce on memories or as you visit other historical sites in the area. 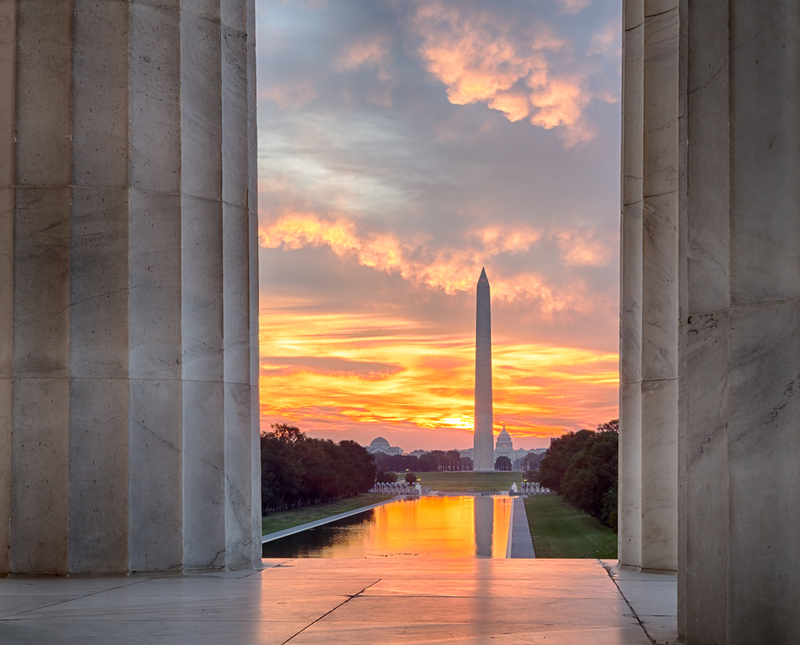 As you finish walking the whole reflecting pool at the National Park, climb those famous steps to the Lincoln Memorial. Take pictures with your friends and family with Abraham Lincoln. This is a memorial spot to be for Independence Day! Awesome light show that for people with sensitive ears, it would be recommended to wear hearing protection. George Washington, from Nova, was the first president of the United States who won many hearts of our countrymen and changed our nation’s destination. As you discover all the historical sites within the National Park you cannot miss this monument. Mr. Washington is world known through many history classes so why not pay respect to the man who gave you freedom in America. After Mr. Washington, meet Martin, who´s name is just as unforgettable. The leader of achieving Civil Rights for every citizen in America deserves at least a minute of reflection of what he accomplished for all of us. He is what makes us proud to be citizens of a country of freedom of rights. This is the third most visited museum in the world that is free 364 days a year. It is home to over 126 million specimens of plants, animals, fossils, minerals, rocks, meteorites, human remains and human cultural artifacts. Also home to 185 natural history scientists which is the largest group of scientist dedicated to the natural and cultural history in the world. This museum contains the largest collection of historic aircraft and spacecraft in the world. If you’re a space fanatic this is your heaven. Take a picture of the first space aircraft made in the world and explore and learn about the achievements mankind has accomplished is space. We may at least know of or heard of a person who has sacrificed his or her youth to serve their country they respect and love so much. Still, we look back at the Vietnam War and fathom on how many lives were affected. Stroll down memory lane with names of more than 58,000 Americans who went for a reason. Let´s pay our respect and reflect on how war never heals. This location is free to visit and is open 24 hours a day. The Holocaust is the famous genocide in our history where about six million European Jews were killed by the powerful Adolf Hitler. You may feel disgusted after learning about what happened to our fellow mankind but it is a great reflection of how great it is to be American. Learn about a special group who maintained their integrity of their faith in God instead of hailing to Hitler. Every day we take for granted how well we have it in America. We live in a country where we gave birth to many world historic leaders who changed the world and made our life the way it is. Democracy rules in this nation and we have civil rights unlike other countries in this modern day age. Washington DC is a magical place, with diversity, as you walk through the national park and visit many important historic monuments. Many flock here, just to be able to dream the American Dream that we have. So why not come and visit? We specialize in roof repair, roof replacements, and new roofs. We understand that not everyone knows everything about roofs, so we'll work with you and explain what we do before we do it. Or fill out our contact form and we'll get back to you.